Chemical reactions happen when one or more chemicals interact with one another. The reaction turns the chemicals into new compounds. For example, a lit candle combines carbon in the wax with oxygen in the air, releasing light and giving off carbon dioxide. Mixing various safe chemicals and observing the reaction is a good teaching method for leaning basic chemistry. 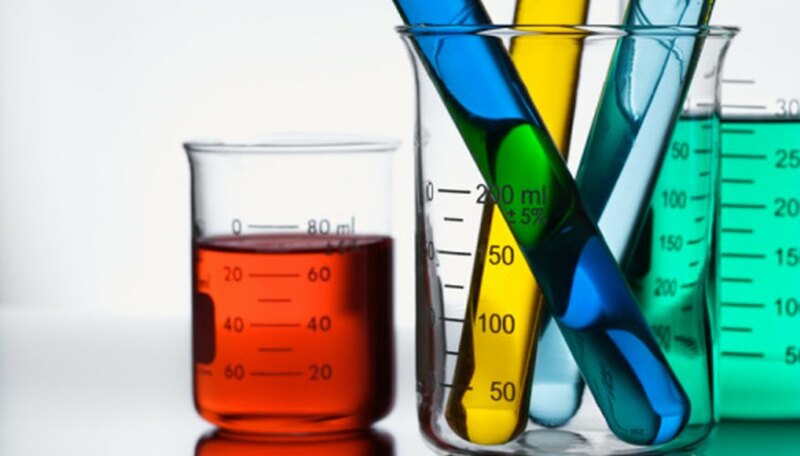 Try some of these simple and safe chemical reaction experiments and have fun. Safety must be considered when performing chemical reaction projects, especially with kids. Whether easy chemical reactions for classroom use or chemical reaction projects at home, simple safety precautions should be followed. Whenever chemicals are used, goggles and aprons should be worn. The advantage of goggles over safety glasses is that goggles prevent liquids from dripping into eyes. Aprons should cover the body from shoulders to knees and wrap around far enough to prevent chemicals from splattering onto kids’ clothes. Many students realize they are doing science when they put on the goggles and aprons. Also, even the safest chemical change experiments can be messy. Use plastic sheets or large trays to help contain any spills or overflow. Mix 1/2 cup vinegar with 2 tablespoons of baking soda. When the baking soda blends with the vinegar, the mixture starts forming bubbles as the reaction takes place. If you have a thermometer, check the temperature of the vinegar before the reaction and of the mixture during the reaction. Add a few drops of red food coloring to the vinegar before adding the baking soda to make a good lava for a homemade volcano experiment. Add a few drops of liquid detergent in with the vinegar and food coloring to create a thick oozing lava. Cornstarch Goo -- Solid or Liquid? Pour one 16-ounce box of cornstarch and 2 cups of water into a large plastic bowl. Mix until all the cornstarch dissolves into the water. Depending on humidity, you may have to adjust the water or cornstarch quantities a little. You will know when your mixture is right because when you stir the mixture very fast, it acts like a solid. When you slowly stir the mixture, it behaves like a liquid. Experiment with the mixture by hitting it with your hand and seeing what happens. Next, slowly slide your hand into the mixture. The mixture drips off the hands, but if you roll the mixture between your hands, it forms a solid ball. Kids enjoy exploring the properties of this goo. Be aware, this experiment will be very messy. Have students work on large trays or use plastic sheets, tablecloths or large trash bags (cut the sides and lay out flat) to help confine the mess and make clean-up easier. Best plan: work outside if possible. Set up this experiment in advance and work in front of an audience. Take a clear glass with a thick bottom and sprinkle 1/2 teaspoon of powdered drink mixture around the bottom of the glass. Swirl the powder around the bottom of the glass so it spreads out and looks like the bottom of the glass. Fill a clear pitcher full of water and set it beside the glass. After the materials are set up, do the experiment. Show everyone the empty glass and tell them, “I’m going to turn this water into wine as it goes from the pitcher to the glass.” Pour the water slowly into the glass, and the chemicals in the powdered drink mix changes the water’s color. Wearing the goggles and apron furthers the illusion of a dangerous reaction. Combine 1 pint of vinegar and 3 tablespoons of salt in a spray bottle. These chemicals react to copper, removing any oxidation from the metal. Place several old, dirty pennies on a flat, waterproof surface. Spray the solution on them. Watch the surface of the pennies and see how long it takes before the pennies are clean, bright and new looking. Stepp, Sue. "Easy and Fun Chemical Reaction Experiments." 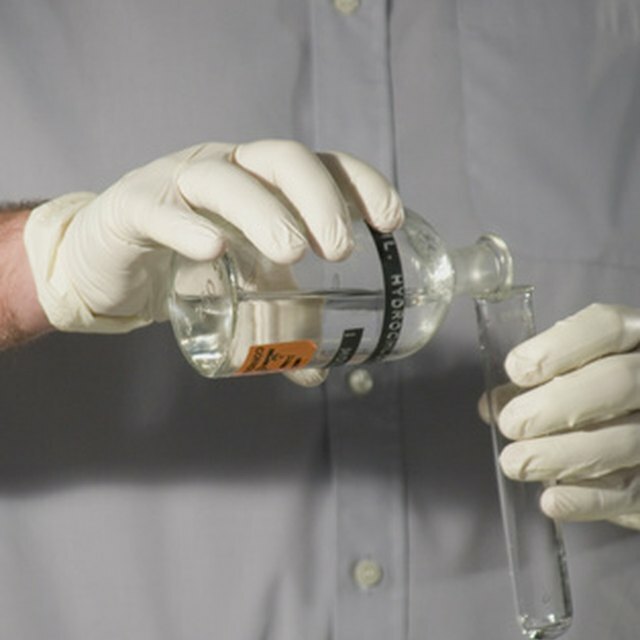 Sciencing, https://sciencing.com/easy-fun-chemical-reaction-experiments-8500826.html. 12 November 2018.